Sowohl Realisten als auch Institutionalisten haben ihre Sichtweisen über das internationale System in den letzten 15 Jahren radikalisiert. Die einen sprechen nicht mehr nur von Bipolarität und Hegemonie, sondern von Unipolarität und Imperium; die anderen nicht mehr nur von Regimen und Institutionen, sondern von Global Governance und Konstitutionalisierung. Dabei können beide Lager durchaus mit guten Gründen auf reale Entwicklungen verweisen. Es fehlt aber an konzeptionellen Perspektiven, die dieser doppelten Entwicklung im internationalen System — der zunehmenden Dominanz der USA und der wachsenden Bedeutung globaler Normen — gerecht werden. Denn erst zusammengenommen ergibt sich ein angemessenes Bild: Es scheint nämlich etwas Drittes, ein „rechtlich stratifiziertes Mehrebenensystem“ zu entstehen. Both realists and institutionalists have radicalized their analyses and findings in recent years. Whereas one camp no longer speaks exclusively of bipolarity and hegemony, but of unipolarity and empire, the other no longer refers exclusively to international regimes and institutions, but to global governance and constitutionalization. And both can refer to real world developments in support of their analyses. However, conceptual perspectives that can do justice to this dual development — i. e., the increasing dominance of the USA in the international system and the increasing significance of global norms — are lacking. The aim of this paper is to present such an integrated view and to argue that a constitutional world polity and unipolarity are not the poles of a one-dimensional category. Instead, it is possible that the significance of international norms and imbalances in the international distribution of power increase simultaneously. To this extent, the talk of both a new empire and of the world republic encompasses real and relevant developments. However, it is not until they are considered in combination that an adequate picture emerges: in fact, according to the core thesis of this paper, a third phenomenon, a “legally stratified multilevel system”, appears to be emerging. International Commission on Intervention and State Sovereignty, 2001: The Responsibility to Protect. Report from the International Commission on Intervention and State Sovereignty, in: http://www.iciss.ca; 20.4.2007. Jasper, Ulla, 2002: Europa, die USA und die NATO. 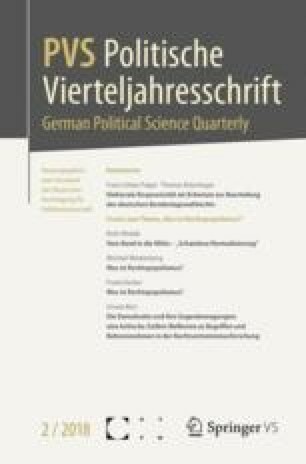 Die Militarisierung der amerikanischen Außenpolitik, in: http://library.fes.de/fulltext/id/01436.htm; 20.4.2007. Schroeder, Paul, 2003: Is the U.S. an Empire?, in: http://www.hnn.us/articles/1237.html; 19.2.2007.